Lockdown by Andrew Gordon Smith is the Hamilton book of the week nominated by Jana Clemmons, the librarian at Loftis Middle School. The book is recommended for middle and high school level students. “This is an exciting book for young male readers. The protagonist is ‘misplaced’ and has to face many conflicts in a dangerous situation. The plot twists and horror situations appeal to those reluctant readers. It's also a series, so they keep coming back for more,” Ms. Clemmons said. 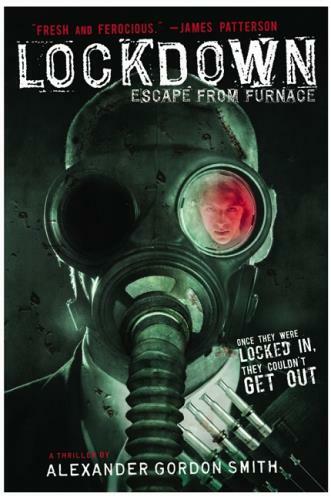 Lockdown is the first of five books in the Escape From Furnace young adult/science fiction series. The books are written from the teenage protagonist Alex Sawyer’s point of view and are about his incarceration in the fictional London prison Furnace Penitentiary. Lockdown: Escape from Furnace is followed by the books Solitary, Death Sentence, Fugitives and Execution in the series. Amazon readers gave the book four and a half out of five stars. From TheBookSmugglers.com: Furnace Penitentiary: the world’s most secure prison for young offenders, buried a mile beneath the earth’s surface. Convicted of a murder he didn’t commit, sentenced to life without parole, Alex Sawyer knows he has two choices: find a way out, or resign himself to a death behind bars, in the darkness at the bottom of the world. Except in Furnace, death is the least of his worries. Soon Alex discovers that the prison is a place of pure evil, where inhuman creatures in gas masks stalk the corridors at night, where giants in black suits drag screaming inmates into the shadows, where deformed beasts can be heard howling from the tunnels below. Behind everything is the mysterious, all-powerful warden, a man as cruel and dangerous as the devil himself, whose unthinkable acts have consequences that stretch far beyond the walls of the prison. Together with a bunch of inmates—some innocent kids who have been framed, others cold-blooded killers—Alex plans an escape. But as he starts to uncover the truth about Furnace’s deeper, darker purpose, Alex’s actions grow ever more dangerous and he must risk everything to expose this nightmare that’s hidden from the eyes of the world. To see more books from the Hamilton Book of the Week series, visit https://www.hcde.org/parents___students/suggested_reading. "Hamilton Book of the Week seeks to move Hamilton County Schools closer to district goals found in the Future Ready 2023 action plan. We hope to encourage kids to read more books for fun by sharing books popular at area schools," officials said. "Goals more students reading will address include: reading improvement will increase the number of students on-track or mastering English language arts; improve the district ACT score to a district average of 21; and reach the target goal of a 90 percent graduation rate by 2023."